WASHINGTON, DC, December 30, 2016 (ENS) – President Barack Obama has designated two more national monuments – Bears Ears National Monument in southeastern Utah and the Gold Butte National Monument in southeastern Nevada. The designations bring to 26 the number of monuments Obama has created under the Antiquities Act, protecting 550 million acres of public lands and waters, more than any other President. The designations complete what tribes, members of Congress, state and local officials, and local business and community leaders have sought for decades, but Congress has failed to take action, so on December 28, the President did. “Importantly, today I have also established a Bears Ears Commission to ensure that tribal expertise and traditional knowledge help inform the management of the Bears Ears National Monument and help us to best care for its remarkable national treasures,” said Obama. The new monuments protect 1.64 million acres of existing federal land in two spectacular western landscapes. Both areas contain land sacred to Native American tribes, important cultural sites, and fragile wildlife habitat. The 1.35 million-acre Bears Ears National Monument in Utah adjoins Canyonlands National Park and the Glen Canyon National Recreational Area. It protects thousands of archaeological sites and areas of spiritual significance sacred to many Native American tribes, who use them today for ceremonies, collecting medicinal and edible plants, and gathering materials for crafting baskets and footwear. The Gold Butte National Monument in Nevada protects nearly 300,000 acres of the Mojave Desert with tree-clad mountains and twisting canyons. The weather-chiseled red sandstone is incised with ancient rock art, and the remains of rock shelters and hearths, agave roasting pits and projectile points are found here. The desert provides critical habitat for the threatened Mojave Desert tortoise. Both monument designations maintain currently authorized uses of the land that do not harm the resources protected by the monument, including tribal access and traditional collection of plants and firewood, off-highway vehicle recreation, hunting and fishing and authorized grazing. The monument designation does not affect valid existing rights for oil, gas, and mining operations, military training operations, and utility corridors. Secretary of the Interior Sally Jewell and Secretary of Agriculture Tom Vilsack joined tribes, members of Congress, state and local officials, and local business and community leaders in applauding the designations. “The rock art, ancient dwellings, and ceremonial sites concealed within these breathtaking landscapes help tell the story of people who have stewarded these lands for hundreds of generations,” said Interior Secretary Sally Jewell. “Today’s action builds on an extraordinary effort from tribes, local communities, and members of Congress to ensure that these treasures are protected for generations to come, so that tribes may continue to use and care for these lands, and all may have an opportunity to enjoy their beauty and learn from their rich cultural history,” said Jewell. “As we move forward with planning for monument implementation, the deep knowledge of the tribal community as well as ranchers, recreationists, archeologists and local community citizens will be heard,” said Vilsack. “We are particularly pleased that the designation affirms tribal sovereignty and provides a collaborative role for Tribes to work with the federal government in maintaining the land. Because Tribes will help manage this land, it reaffirms President Obama’s fundamental commitment to human rights and equity in voice,” Begaye said. 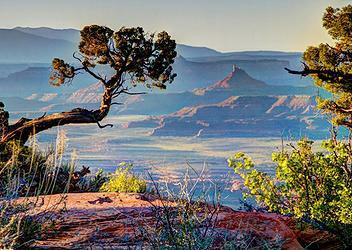 In July, Republican Congressmen Rob Bishop and Jason Chaffetz proposed the Utah Public Lands Initiative (H.R. 5780), which intended to conserve 1.39 million acres (1.28 million Federal acres) in mostly the same area as the Bears Ears National Monument by designating two new National Conservation Areas and a Wilderness, which would prohibit future mining and oil and gas activities in these areas. Their legislation also proposed a Tribal Commission to help inform management of the area and created additional opportunities for stakeholders to offer input, similar to what Obama has established. “This arrogant act by a lame duck president will not stand. I will work tirelessly with Congress and the incoming Trump administration to honor the will of the people of Utah and undo this designation,” declared Lee on Wednesday. 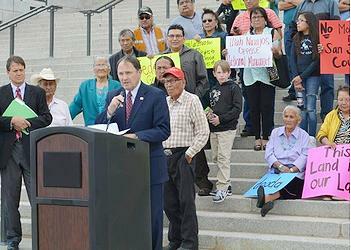 Utah Governor Gary Herbert joined San Juan County Native Americans at the state Capitol Tuesday afternoon to oppose designating Bears Ears as a national monument. “A Bears Ears national monument is not supported locally. It would exacerbate an already tense situation, and fan the flames of conflict on Utah’s public lands,” Govenor Herbert said at the rally. The governor, Commissioner Rebecca Benally, who is Navajo, and others at the state capitol said that would be the wrong way to protect the area. Benally said that establishing a national monument would further harm Utah’s most economically distressed region, putting federal bureaucrats who are unfamiliar with their history and traditional ways in charge. The measure could prevent Navajos from hunting, gathering wood and medicinal plants, and performing their cultural traditions, she said, although Obama’s designation specifically allows these activities in the new monument. Governor Herbert said at the event that there is a better way to protect the area—one that has garnered widespread support, respects Navajos’ religious freedoms and cultural traditions, and better preserves such iconic locations such as Cedar Mesa, Indian Creek and Bears Ears Buttes. is the right mechanism to accomplish the right goal,” the governor said. SUWA says that their staff worked for three years with Utah federal legislators and their staffs to find a compromise. unprecedented provisions that would limit federal land managers’ ability to manage public lands for the protection of natural and cultural resources,” said SUWA in a statement. “The PLI furthers the State of Utah’s land grab efforts by transferring thousands of acres of federal land to the state, without compensation, for development and increased motorized and non-motorized recreation. The PLI permanently establishes livestock grazing as a priority and would result in both increased and new grazing in areas currently closed by federal land agencies due to natural and cultural resource damage,” said SUWA. Native American tribes whose ancestral lands include the Bears Ears area advocated for permanent protection, led by the Bears Ears Inter-Tribal Coalition made up of the Hopi Nation, Navajo Nation, Ute Indian Tribe of the Uintah Ouray, Ute Mountain Ute Tribe, and Zuni Tribe. Numerous tribes with ties to the region, including the above tribes, have passed resolutions and sent letters in support of a national monument designation. The area’s tradition of ranching, which dates back to the late 1800s, will continue. Grazing permits and leases will continue to be issued by the Bureau of Land Management and the U.S. Forest Service. Recreationists strongly support the monument, which will protect the area’s world-class rock climbing, hunting, backpacking, whitewater rafting, mountain biking, and off-highway vehicle recreation, sources of economic growth for southeastern Utah. The proclamation also directs the Secretary of the Interior to explore within 30 days a land exchange with the State of Utah, which would transfer Utah School and Institutional Trust Lands Administration land within the Bears Ears boundary in exchange for Bureau of Land Management land outside of the boundary. The Department of the Interior’s Bureau of Land Management (BLM) and the Department of Agriculture’s Forest Service (USFS) will jointly manage Bears Ears National Monument. Both agencies will jointly prepare a management plan developed with maximum public involvement, including tribal, local and State governments, permit holders, other stakeholders and other federal land management agencies in the local area, including the National Park Service. Gold Butte remains culturally and spiritually important to the Southern Paiute people, particularly the Moapa Band of Paiute Indians, who collect water from the mountain springs, gather traditional sources of paint, harvest pinyon pine nuts and other resources, and access ceremonial sites. The area is popular for outdoor recreation, and visitors to the monument can hike to rock art sites, drive the Gold Butte Backcountry Byway to the area’s namesake mining ghost town, hunt desert bighorn sheep, or tour the area’s peaks and canyons on horseback. This presidential designation is the result of the strong leadership of retiring U.S. Senator Harry Reid of Nevada along with Representative Dina Titus, as well as support from the Moapa Band of Paiutes and Las Vegas Paiute Tribe. In 2015, Deputy Secretary of the Interior Michael Connor and BLM Director Neil Kornze attended a public meeting hosted by Senator Reid and Representative Titus to hear from the public about protection and conservation of Gold Butte and other areas in southern Nevada. Supporters of protecting the area include local elected officials and governments, area businesses, hunters, anglers, recreationists, and local land trusts and conservation groups. Livestock grazing has not been permitted in the Gold Butte area since 1998, in support of Clark County’s Habitat Conservation Plan to conserve critical Mojave Desert tortoise habitat. The Monument will be managed by the Bureau of Land Management. The BLM and USFS staff will schedule informal open houses on Bears Ears National Monument in January to answer questions from permittees and other interested stakeholders, and as part of the formal management planning process will announce public sessions later this winter and spring. Details of these listening sessions, including dates and locations, will be shared with local newspapers and posted to the monuments’ websites. The BLM will also hold public meetings on Gold Butte National Monument. Planning for both monuments will be done with full public involvement, with special emphasis on understanding the ideas and concerns of the local communities, the agencies say. The Antiquities Act has been used by 16 presidents starting with President Theodore Roosevelt in 1906 and used to protect treasures such as the Grand Canyon, the Statue of Liberty, and Colorado’s Canyons of the Ancients. A map of the Gold Butte National Monument can be found here. 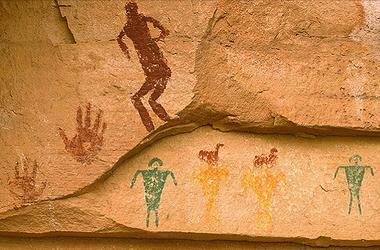 A fact sheet and Questions and Answers on Gold Butte National Monument can be found here.